AUGUSTA – The Maine Republican Party today is calling upon Speaker Sara Gideon to take action to protect the integrity of the Maine House of Representatives after news that another Democrat involved in recent tax policy issues and associated with Maine’s union interests will be investigated by the Maine Ethics Commission, this time for illegal lobbying in violation of recently passed ethics reforms. The law, passed unanimously by the Maine Legislature and signed by Governor Paul LePage, prohibits former State Legislators from serving as paid lobbyists for one-year after their service in the Legislature ends. Former State Representative, and organizer for the Maine People’s Alliance Adam Goode, of Bangor, has been serving as a paid lobbyist and ‘Legislative Director’ for the AFL-CIO for much of this legislative session, as shown by documents outlining his regular testimony and first-hand accounts of his constant presence in the state house. “Just this past week, Mr. Goode was in the state house lobbying for nearly seven hours in just one day, and admitted on mic that he was being paid to lobby specific bills – how can he say with a straight face that he did not exceed eight hours in a month?” asked Jason Savage, executive director of the Maine GOP. Mr. Goode comes from the same line of Maine People’s Alliance organizers that have controlled state government to the detriment of the people of Maine for years. In fact, Goode is Rep. Ryan Tipping’s predecessor on the taxation committee, and is known to have appeared on left-wing podcasts with Rep. Tipping in support of the destructive referendums threatening Maine’s economy. “Mr. Goode seems to think he is above the law, but preventing situations such as this is exactly why Maine undertook bipartisan ethics reform – the integrity of the people’s government must be protected,” said Dr. Kouzounas. “We are confident that when the Maine Ethics Commission sees the piles of testimony Mr. Goode has filed with the legislature, and hears first-hand how Mr. Goode has been in the State House day after day all session, that he will be held accountable,” said Mr. Savage. “The people’s government is not meant to play out as a sequel of the movie “Catch Me If You Can”, and if Speaker Gideon does not act, she will be declaring that she is Speaker of the Swamp, not Speaker of the House,” concluded Dr. Kouzounas. The Bangor Daily News recently reported on this story, but missed much of the nuance in a Friday news dump quoting Mr. Goode. 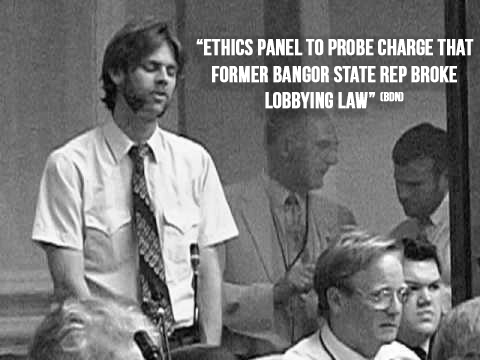 Three times in recent history, (Speaker Eves at Goodwill Hinckley, Rep Ryan Tipping on conflict of interest, and now Adam Goode on illegal lobbying) Maine Democrats have claimed to have been “cleared” by the Maine Ethics Commission when caught doing something they should not have been doing, each time citing conversations with a member of the Maine Ethics Commisson staff, when they were not, in fact, cleared by any member of the Maine Ethics Commission. At best, these conversations with Ethics Commission staff should be viewed as informal guidance – not approval to move forward with impunity. It may be necessary for lawmakers to undertake a reform of the processes that lawmakers must use to get approval for certain activities if Democrats continue to dishonestly hide behind informal conversations with staff at the Ethics Commission as if they were carte-blanche approval of whatever they wish to do.